Acme Roof Systems provides the highest quality, most dependable commercial roofing services in the DFW Metroplex. Our team of skilled and experienced roofing experts conduct inspections, detect and repair leaks, and offer other services specific to commercial roofing needs. Contact us for an estimate! When you have a roof that has extensive damage, having it replaced might be your best option. At Acme Roof Systems, we provide reliable commercial roof replacement services that include helping you determine which roofing material suits your building best. We’re also available to replace your roof for efficiency or aesthetic purposes. When it’s time for your business to invest in a new roof, Acme Roof Systems can help you select the right type for your commercial building. We offer dependable commercial installation services using high-quality materials, and we work with the greatest of efficiency so that your business can continue with its normal operations as soon as possible. Leaks that go undetected can become a major issue that could cost your business time and money. We can check for leaks in your roof and perform any necessary roof repairs to prevent water damage or structural damage. Choosing a roofing type for your commercial building can seem overwhelming if you know nothing about roofing. Acme Roof Systems is here to guide you through the process of choosing the best roofing option for your building and individual needs. 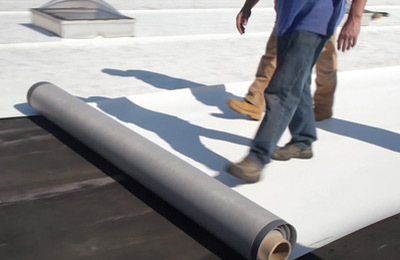 TPO, which stands for Thermoplastic Polyolefin, is a highly durable, cost-effective type of commercial roof that can be installed easily. 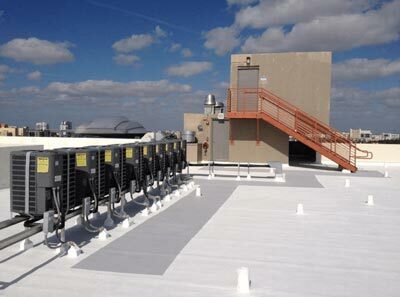 This heat-resistant, chemical-resistant and energy-efficient roofing can provide continuous savings to your company. Single-ply roofing systems for commercial buildings offer important benefits, such as cost-effectiveness, easy installation and exceptional protection from the elements. Acme Roof Systems can help you determine if a single-ply roofing system is suitable for your building and if it is the best option for your individual needs. Modified bitumen roofs for commercial buildings are made of asphalt products and are built to last for 20 years or more. These roofs are resistant to leaks, as well as damage from hail storms, high winds, and even fire. Metal roofs for commercial buildings provide several important benefits, such as energy efficiency, a high degree of durability and a low need for maintenance. They are also resistant to fire and can last for decades. We perform thorough inspections of commercial roofs to check for early warning signs of damage or other potential problems. This helps prevent these problems from turning into significant damage that can cost your company a lot of money to repair later on. At Acme Roof Systems, we have the knowledge, equipment, and materials needed to provide outstanding service to address the needs specific to industrial roofs. Whether you have a warehouse that needs a new roof, a school that needs roof repairs, or any other kind of industrial roofing need, our professional roofing contractors are here to help. Routine roof maintenance on your commercial roof helps ensure that it remains in top condition for years. Acme Roof Systems offers roof maintenance programs that are designed to help extend the lifespan of your commercial roof. Contact us today for an estimate or more information.